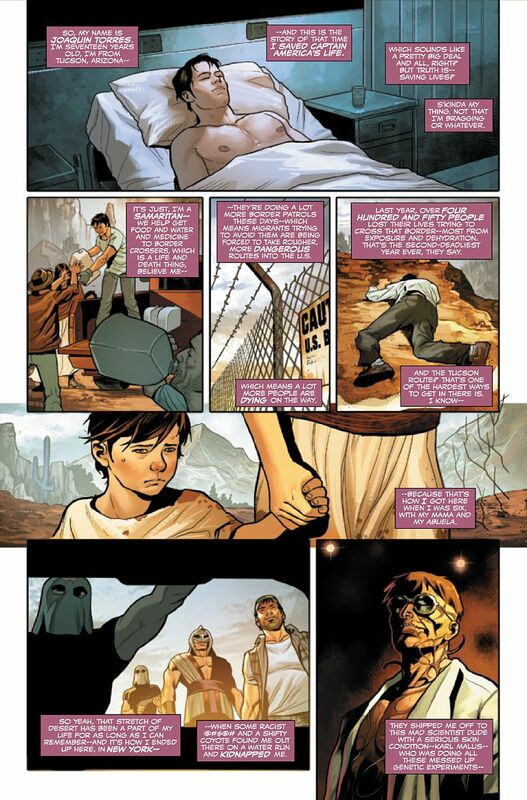 In Nick Spencer's script, he pens a sob-story where the new wearer of a Falcon costume says, "Last year, over four hundred and fifty people lost their lives trying to cross that border - most from exposure and dehydration. That's the second deadliest year ever, they say. And the Tuscon route? That's one of the hardest ways to get in there is. I know - because that's how I got here when I was six. With my mama and my abuela." This is one claim I definitely won't buy coming from such a dreadful left-wing site. Yes, keep going about the sob-stories for illegal immigrants, please, and continue to ignore how there's always the danger of violent criminals infiltrating the USA, terrorists included. What's particularly disturbing is the strident obliviousness to lawbreaking demonstrated by pseudo-opinionators like the one who wrote that nonsense, which is insulting to Latinos. Both Spencer and the Mary Sue writer turn their backs to Latinos who are against illegal immigration, and don't consider how there's plenty out there who disapproved of Obama's executive amnesty program too. While we're on the Captain America subject, Steve Rogers is being brought back to his role at the same time Sam Wilson is kept in the contrived replacement role. But Spencer is going to as much a writer of this extra title as he is the one with Wilson. And if he's on board, you can be sure it won't be any better, and his ultra-leftist politics are quite likely to remain in place. I must be dense. I don't understand why the US has an obligation to take in illegal immigrants and provide a "better life" for their children, but the governments of Mexico, Honduras, and Guatemala apparently don't have an obligation to improve conditions and provide a "better life" for their own people in their own countries. But then, I don't see why the US and Europe should admit Syrian refugees when Saudi Arabia and the UAE won't. It's just white guilt, period. In their own heads there is no real rationalizing why they think the way they do. It is based on emotion, not logic. They have a sick sense of hating their own whiteness, because they think that all of their ancestors were like Southern slave owners or Nazi stormtroopers. This is the mental image that the media and education system has given them of their heritage. They feel this constant subconscious sense of guilt. So bending over backward to every non-white person, for any conceivable reason, gives them this euphoria rush, like they are actually--momentarily--atoning for their Original Sin. That's the other thing. They don't have any traditional Judeo-Christian religious sense, no real understanding of sin. Yet the perception of sin is actually inherent in their very human nature. But they don't understand it as sin. They can't name it, because they're not religious and thus lack the vocabulary to name it and understand it for what it is. So, instead, the sense of sin causes them to feel constant guilt over their ethnic nature. They are constantly, understandably, sensing that they are sinful people. And so they must constantly try and convert their own sinful feelings into white guilt. I am in my 40s. Never, ever, ever, ever, ever have I once heard any policy-maker in America suggest that perhaps we should just help Mexico or help the Mexican people--IN Mexico. Instead the only solution is to allow as many of them as possible to come to our country and live on however much welfare can possibly be given to them. It's the same with the migrant crisis. The few odd calls for simply establishing a safe zone near Syria are greeted with silence. Crickets. Instead the solution is to let refugees embark upon long dangerous journeys, simply so they can arrive in a white country. What sense does any of that make? It only makes sense if you start with the presupposition that the most important thing is for white countries to offer infinite help, no matter what. It is unfair even to the non-white people. I don't blame them for wanting to migrate. They are given propaganda promising incredible lives with more monetary aid than can possibly be funneled their way. Many of them make dangerous journeys, only to arrive and find out that the economies of their new homes are not as great as promised, that life is not as easy as promised, and that there is realistically not a great chance of them making a great life for themselves. It is unfair to everyone. Yet it apparently has to happen because the leaders of white nations would rather risk EVERYTHING simply in order to subjugate their own people. They are apparently fine with everyone's standard of living falling, and they will lie to the migrants if that's what it takes to cram them into our countries. Then Trump is vilified in most media simply because he speaks out against this with SOME anger. Even speaking out with this modicum of anger totally set him apart from every other politician, including those on the "right". But think about how the mainstream media vilified him for simply saying, in the wake of the Paris attacks and the San Bernadino attacks--and in the wake of ISIS actually SAYING that they were going to CONTINUE posing as refugees--that we should simply pause Muslim immigration TEMPORARILY so that we could assess the situation. Even this modicum of common sense gets him treated as if he were Adolf Hitler ordering a new Holocaust. The very suggestion that perhaps we should stop and rethink things, to make sure that our borders are secure and that are immigration policies are not still allowing stated terrorists to enter our country--even this relatively small amount of caution is too much for white-guilt-tripped people to bear. When will Ms Marvel be shown punching out ISIS? I'll go with the white guilt theory, myself, with a dash of perverse sexual thrill whenever they do these things. Mere conviction isn't enough, there has to be something else to keep them going. "It is unfair to everyone. Yet it apparently has to happen because the leaders of white nations would rather risk EVERYTHING simply in order to subjugate their own people. They are apparently fine with everyone's standard of living falling, and they will lie to the migrants if that's what it takes to cram them into our countries." "When will Ms Marvel be shown punching out ISIS?" I'd love if someone could pose that to Sana Amanat. As for the link, knew some fandom people would revolt but makes sense some Marvel staffers would, as per Nick Spencer and Peter David's shown disdain for Trump in their comic work. Heh. This is delicious, to borrow a M. Bison meme. Ye gods, and I thought the "Snap" Wilson bit was terrible enough. Why does the Falcon have to have these "bleck" moments attached to his personal history again? As for the immigrant problem, its a global groupthink issue: instead of fixing the problems at home, they'll send their problems and undesirables to far-off lands to keep up the illusion that everything's fine.